Here's a little how-to and example script to demonstrate the connection of a cheap 0,96" 128x64 pixel OLED display (4-pin i2c bus, SDD1306 controller) to an NodeMCU ESP8266 development board. 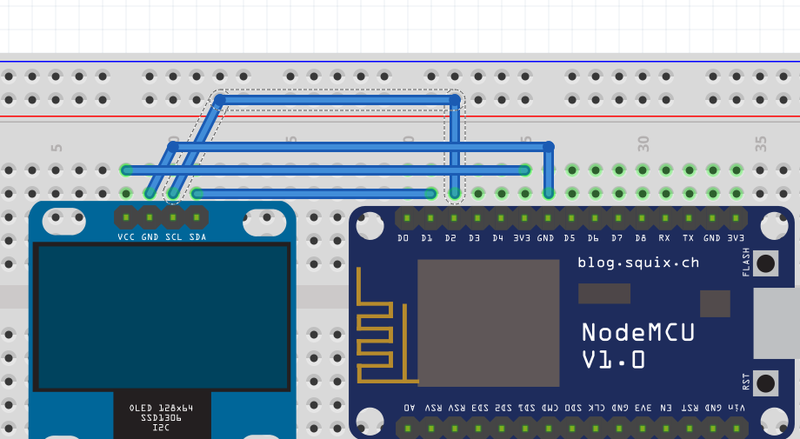 We have pins D1 connected to the displays SDA connector, and NodeMCU's pin D2 to SCL, Ground to Ground and VCC to 3V3 - the normal i2c connection. We're basically drawing a frame here, around the full size of the display, then, on each frame, we're shrinking the dimensions of this frame by a pixel - generation a little animation. The OLED is controlled by an SSD1306 and we're using the u8glib library to drive it. In my older firmware I'm using here, it's already included. -- supports speed "SLOW"), you will trigger a crash! An interesting detail is the maximum frame-rate achievable on this display via i2c. I've tracked the maximum down to be between 200 and 300 milliseconds in-between display refreshes. As I understand it, that's the time it takes to push the data over the i2c bus + some ms. If you go lovwer than that, with your timer triggering, you crash the board. The i2c speed is a NodeMCU limitation. Compare the docs to find out that the only mode NodeMCU supports is "SLOW". Changing the CPU frequency to 160, via node.setcpufreq(node.CPU160MHZ), won't help. Markus has managed to get higher frame-rates, but only by hacking the underlying library and removing some hard-coded slow-downs.